If you’re seeking someone to care for your pup while you’re out of town, look no further than Camp Bow Wow®. We are the premier dog care facility in Lincoln that provides both day care and overnight boarding. Whether you just need help for the day or for an entire week, we can accommodate your needs. With us, your dog will have the freedom to run, play, and romp in our large climate-controlled play yards and will receive the tender loving care they deserve from our dog-loving Certified Camp Counselors®. You can even check in on your pup from afar via our live web cams. So rest easy and enjoy your trip—your pup will be loving their time at Camp! 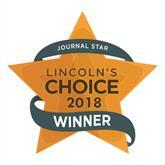 A huge thank you to all our customers and staff for voting us best of Lincoln for 2018! We love caring for your campers and couldn't do it without you! Leaving your pup with someone you don’t know can be worrisome, and we completely understand. That’s why at Camp Bow Wow Lincoln, you can rest easy knowing your pup is safe in the hands of our trained and Certified Camp Counselors®. We even interview all our Campers to make sure they will play well with others and are up to date on their vaccinations. The safety, health, and happiness of your furry family member is our top priority. Come see what all the bark is about today. Contact us at (402) 474-9663 to schedule your pup’s interview. Get your first day free!